and completion of bringing this classic back to its former glory. I had been trying to track down my own Keith Simpkin built Formula Ford skiff Robca, when I heard that Rebound might be for sale. The boat was in the ownership of Kevin Male at Murray Bridge. A trip to Murray Bridge to inspect the boat confirmed that this was a genuine Aussie classic in fabulous condition, and a deal was done.. 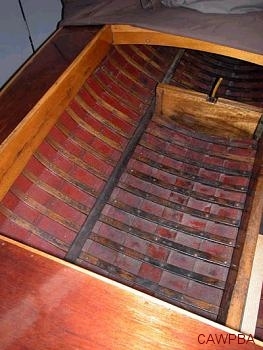 Rebound is a genuine Frank Lewis skiff, just short of 17’ in length from the bow to the transom. The boat was built in 1968 for Edgar McDonald of Mt Gambier in South Australia. Edgar was a self confessed Corvette enthusiast and he fitted a 327ci Chev Corvette into Rebound. With a reputation as an exceptionally hard charging driver, the 1968 built Rebound continued to perpetuate the folklore. Rebound comes with an interesting background … at this stage yet to be fully appreciated or substantiated. The boat is reported to be wild riding and unpredictable. There are stories that various owners were pitched from the drivers seat. Others claim that the boat would, for no apparent reason, pitch then deviate off a straight line. The hull was not raced very much, although the current owner is believed to be the sixth. It seems that Rebound put the wind up most of those who sat behind the wheel. Edgar McDonald was killed in a car accident at Mt Gambier, just a few years ago. With his passing a lot of the history of the boat will also have vanished. Part of the Rebound project is to track down the heritage of the boat. This is to be achieved by speaking with Edgar’s family, those who raced with him and those who crewed on the boat. 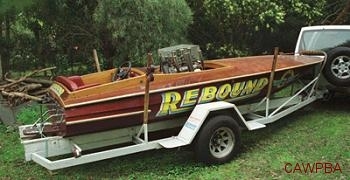 Plenty of the appeal of Rebound is the near original status of the boat. The hull is in exceptionally good condition with not a sign of rot anywhere. This hull has not been raced very much at all and from anecdotal evidence, it has not been in the water for perhaps two decades. 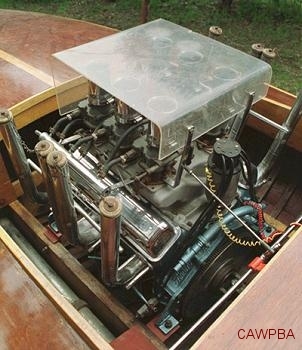 The boat was purchased on its original trailer with a 327 Chev Corvette engine on board. Although Rebound is essentially in great condition given its age, it is still a long way short of being water ready. 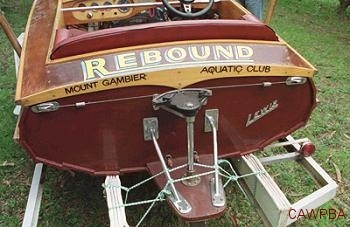 Rebound’s days as a race boat are over. The refurbishment project is a labour of love with the ultimate objective to build-up a faithful restoration of Rebound as it was raced by Edgar McDonald. It would be easy to fit a 350 Chev with a four barrel carbie on top, but that’s not how the boat ever raced. The boat is to be put together as close to original specs as possible. When the project is completed, Rebound will attend classic boat shows and perhaps once or twice a year, take to the water for a kickin and buckin blat. Due to the excellent condition of the rig, the project is really one of refurbishment as opposed to a restoration or rebuild. A careful assessment of the rig determined that there was virtually nothing structurally amiss with the boat. The basic strategy was to strip the big skiff back to a bare, unrigged hull, then re-assemble the boat, neatly and tidily, back to original condition. Initially most work went into the unregistered trailer to bring it up to current day safety and registration requirements. Thereafter the plan has been to work on the hull and then ultimately the Chevy engine. There is no need for any structural timber work being required for the clinker hull or deck. The hull is very serviceable although it will no doubt leak quite well like most other great skiffs that emerged from the Lewis workshops!! Trailer - The initial effort on Rebound went into the trailer. The unit is all steel and very well built, presumably as Edgar McDonald expected to travel a lot for his racing. However the trailer needed to be brought up to meet current registration requirements. This involved a new axle with disk brakes, new hitch/coupling, new tyres, light board, re-wire and re-build of jockey wheel. A set of mudguards needs to be fitted to accommodate the wider axle, the trailer bearers need new carpet and then the whole unit will receive a fresh coat of paint. Deck - There are some signs of racing wear on the deck. Double-nailing down the centre line of the deck to one side indicates that the deck sprung loose at some time. Also it appears as if the side decks alongside the engine and cockpit have possibly been replaced at some time. There are some visible signs of water getting under the varnish in a few places and there are also signs of the vanish starting to break down on the deck in general. The deck requires a thorough but relatively light sand then a complete re-varnish. 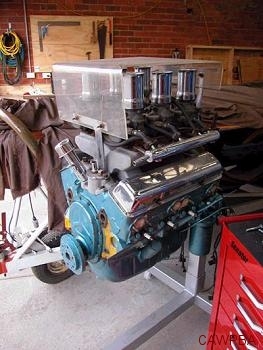 Engine - The Chev Corvette is going to need a bit of work to get it operational and looking great. 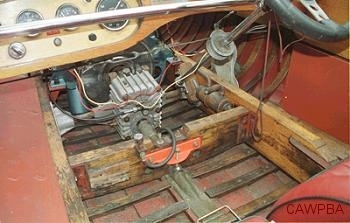 As a long block, the engine is in good operating condition. By modern day standards the engine is reasonably mild, and that suits the objectives of this project. All of the bolt on gear however needs to be removed, cleaned up then re-fitted. There are six Stromberg 97 carbies fitted to an Edelbrock bow-tie inlet manifold. The carbies need a complete and thorough re-build and the throttle linkages are all in need of replacement. The engine is short of a fuel pump, starter, plumbing for the cooling system and generally needs to be dressed and presented properly. Gearbox - The drive train involves the drive being taken off the flywheel end of the Chev with a universal attached to a splined shaft linking it to the Haynes & Hellyer Z drive gearbox. While the gearbox is in fine condition, the mounts were seized and out of alignment. The gearbox mounts have already been repaired and the gearbox is ready to be reinstalled when the hull is refurbished. 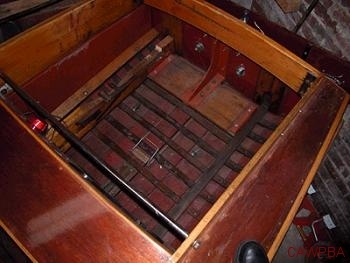 Running Gear - the propshaft, rudder, skeg and steering gear are all sound and can be re-fitted with a clean up. The stainless steel steering cable will be replaced and the steering system will be refitted with a view to modern safety requirements. A set of old Rebound props was unearthed and acquired from a car wrecker in Mt Gambier. Most of the props are not serviceable, but those that are intact will be trailed at some future stage. Hull Bearers - After removing the engine and running gear, it was decided to also pull the bearers out. Initially it looked like ‘mission impossible’ to get the full length bearers out through the rear cockpit, but after being unbolted they slid out effortlessly. The inside of the hull has copped a modest amount of discolouration from leaking engine oil. The bearers are also showing some signs of age and a small amount of oil penetration. By removing the bearers, the inside of the hull can now be properly cleaned out and refinished. The bearers can also be stripped back, re-varnished and then refitted with new angle iron and retaining bolts. The old angle iron on the bearers was badly rusted and retaining bolts similarly weakened - the whole lot are in the dumpmaster! The cross bearer across the log was shot and needs replacing. New backing plates are to be made for the engine mounts and gearbox mounts.